She worked for The Romanian Television from 1980 until 1999, first as a film translator, then as a program producer. Here she had translated and subtitled over 500 movies and signed programs like: “Video-Guide”, “Series of Series”, “Screen”, and “Film Puzzle”. She had dubbed live almost 5000 movies on video (from English, French, Italian and Spanish), She has translated over 100 books, novels, dictionaries and plays. She conceived several cine-documents “Is History Repeating Itself?” a portrait of the huge actor Toma Caragiu, and a film study about the “Impact of Dallas soap-opera over the Romanian viewers”. 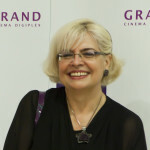 In 1993, she produced, in French, for TV5 Europe a one-hour program called “The Romanian Cinema after 1989”. She was the live commentator of film ceremonies such as: César, Cannes, Oscar, BAFTA, EMMY. She covers for the written and audio-video press famous festivals such as Cannes or Berlin. She interviewed important personalities such as Giuliano Gemma, Bernard Pivot, Alan J.Pakula, Frédéric Mitterrand, Rutger Hauer, Sam Karmann, Park Chan Wook, Anthony Minghella, Yann Tiersen, Jean-Claude Carrière, Julie Délpy, Grace Zabriskie, Pim Van Hoeve, Michael Nyman, Bruce Beresford, Peter Greenaway, Charles Aznavour, Francis Ford Coppola, Dardenne brothers, Carole Bouquet, Isabelle Huppert, and several ambassadors. She was an HBO adviser and a member of the screenplay jury in more film financing procedures of CNC (The Romanian National Fund of Cinematography).